On 14th June 1937, No.82(B) Squadron was formed at Andover, initially as a two-flight squadron. The nucleus of the new unit came from No.142(B) Squadron, but personnel, including AC1 Orchard, also came from other units. Not for the last time the Government's decision of 1935 to expand the RAF had a direct effect on Harold. 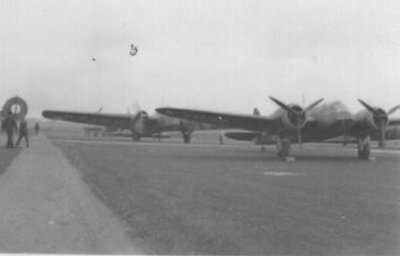 The first aircraft equipping the squadron were Hind bombers, as was the case with 12(B), but these were soon to be replaced. The first Squadron Commander was Sqn. Ldr. N.C. Pleasance. On formation, the unit's strength was 13 officers, 13 senior NCO's, 13 corporals and 53 aircraftsmen. The unit remained at Andover for three weeks, but then, on 8th July 1937 (at 0900, according to the Operations Record) it was established at its new base at Cranfield, in Buckinghamshire, where the new Station Headquarters had been established on 1st June previously. 82(B) joined No.108(B) Squadron which had arrived two days earlier from Farnborough. No.62(B) followed 82(B) from Andover four days later. This squadron and airfield were to be Harold's home for the next two years, his longest stay in one unit. For the next few months, the Operational Record shows the growth of the new squadron, with references to new postings and promotions. During this period, on 1st August, Harold himself was promoted to Leading Aircraftsman, with a consequent increase in pay of some 1s 3d a day. A tragedy occurred on 12th October when Pilot Officer J.L. Wells was killed whilst flying a Hind at night. Another accident occurred on 5th November, when three Hinds were coming in to land, flying in a 'V' formation. The wing tips of the central and right hand aircraft touched and the two planes swung into each other, nose to nose, and were completely wrecked. Harold was away from the squadron and Cranfield from 23rd October to 9th December, attending an Air Gunners course at No.2 Air Armament School, located at North Coates, Lincolnshire, returning to 82(B) with the new designation of 'Part-time Air Gunner'. During his absence, influxes of personnel and promotions had continued.